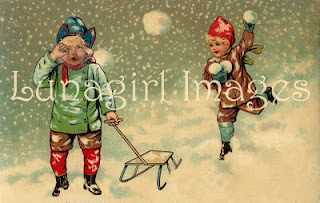 Lunagirl Moonbeams by Lunagirl Vintage Images: More Snow?!? Does it make you want to laugh or cry? I'm not sure myself! Copyright image from our Lunagirl Christmas New Years Photo Postcard collection.